Ok, since the 1st version of the Vengeance Crusade is officially mocked up with random updates from me... I might as well leave it in the tattered pages of history, and like the Dark Knight and the Man of Steel... time for a "reboot" so in this thread I will place the Background story development, some WIP, finished BT models, and make this the official blog spot for this Crusade, that I hope to update atleast once a month until the Crusade is officially over. It is the 41st Millennia and humanity is on the verge of extinction. A Dark Age spreads across the once resplendent Imperium of Man, but even in this dark hour, hope still strives. Numerous Space Marine Chapters, the defenders of Humanity, fight across the galaxy, defending the Imperium from the onslaught of Daemons, Xenos and Traitors, and protecting it from the ruination of Heretics. Among them are the fiercest and most zealous Crusading Chapter of all, the mighty Chapter of the Black Templars. The Black Templars have crusaded since their founding in the aftermath of the Horus Heresy. They have attempted to reclaim what the Imperium had lost during those dark days when Brother fought Brother, when gods marched among then and fought against one another, and laid waste to entire systems across the galaxy. In this 10,000 year old Crusade, the enemies of this noble Chapter have plotted and schemed. Now they have grown numerous and powerful and the full extent of their treachery is about to unfold. Edited by Marshal_Roujakis, 11 July 2017 - 06:33 PM. Sounds awesome! can't wait for more! Agree, this sounds very interesting. Before you get all texted up, I think it was Panzer posted a template for crusades that adds some visual pizzazz to your text that you might consider adopting. I think eventually a number of us were going to adopt the template as a show of force. Wouldn't happen to have a link to that template would you Honda? Off to a promising start brother, looking forward to seeing more of your vengeance crusade! It's in the Eternal Crusader pinned topic up top. I'd get you a link, but I seem to be having difficulty using the dialogue boxes in editing, e.g. inserting links or images. Right now, I'm creating my larger posts in Word or Notepad and copying over the html code to duplicate functionality. The posts are fine, but the dialogue boxes just hang on me. Not sure what's going on. The Inquisition has always had an ambiguous relationship with the Emperor’s Angels of Death. Some Inquisitors use collaboration and cooperation, some use a common goal or a common enemy, and some even go as far as using treachery and blackmail to get the support of the Space Marines. For the Imperium, the Space Marines have always been its most stalwart guardian, the immovable object that has anchored humanity’s survival and the sword that cleaves into the heart of its enemies. 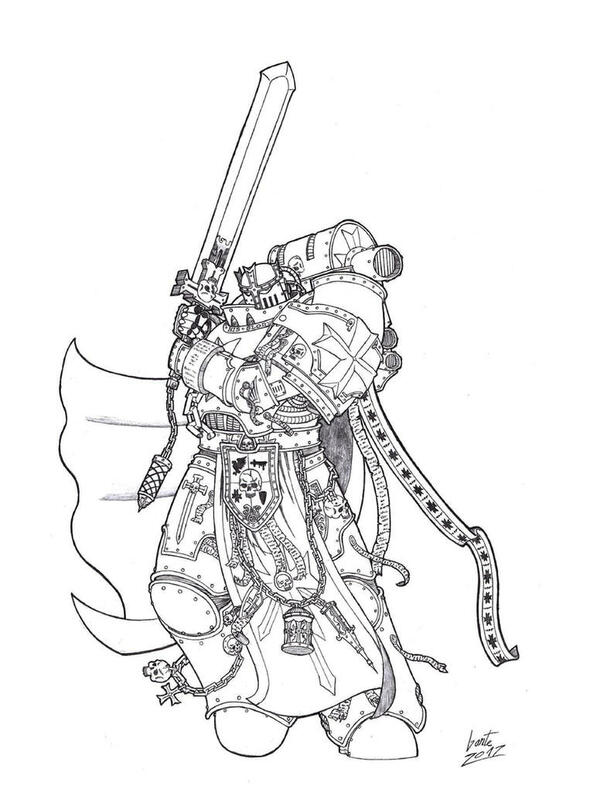 For an Inquisitor to gain the support of an entire Space Marine Chapter, speaks volumes about his charisma, capabilities and power, because a Space Marine Chapter is as independent to the bureaucratic entanglement of the Imperium as the Inquisitors themselves. Each Chapter follows the strict guideline of one of their ancestral demi-gods, Roboute Guilliman, a mighty son of the God-Emperor and the master of the Ultramarines and their successors, his doctrines divided the old Astartes Legions into Chapters comprising of a thousand Space Marines each, they would have the capability to man their own weapons, pilot their own ships and wage war for the God-Emperor in whatever battlefield of their choosing, thus, making them one of the most powerful factions of mankind that is completely independent of the Imperium. A single Space Marine is a powerful towering figure, he stands taller than any unaugmented human, moves faster than any normal man and they are powerful enough to stand toe to toe with a monstrous Ork leader, to an Inquisitor, it would be an assurance of victory over any foe if the Space Marines are on their side. But alas, even the indomitable and fearless Space Marines can fall to heresy, much like Horus the favored son of the God-Emperor and the destroyer of everything that the Imperium of Man once stood for, during the fires of the greatest war humanity has ever known, the Horus Heresy. It was after these dark times that the organization, that I am proud to be a part of, was born, the Lords of Terra and the soldiers of the Imperial Creed created the Inquisition, the order that would root out the seeds of deviancy, heresy and Chaos from within and outside of the Imperium before it could grow and destroy us all. It has always been my fervent belief that the strongest enemies of the Imperium of Man lies not in the enemy that we could see, but from that which hides in the shadows biding its time with patience and scorn and suddenly striking silently and mercilessly until there is nothing left of the God-Emperor’s worlds. Now, a sadistic trail of murder and corruption has arisen that pointed me and my investigations to the world of Jerulas, a once hostile world which, with the aid of a Space Marine Chapter, has returned back to the light of the God-Emperor and now stands as a stalwart bastion for the Isale Sub-sector. A shadow has crept into the dark recesses of this world, a phantom of malice that is attempting to once again pitch the Imperium into the void of extinction, and bring the mightiest empire in the galaxy to its knees. I must uncover this conspiracy, and I must not fail, but first I must gain the aid of the Lords of Jerulas, the Black Templars of the Adeptus Astartes, because if I fail, then this world will burn, and the seal of the Inquisition shall see it so. But for now... enjoy and give me feedback. Edited by Marshal_Roujakis, 19 April 2017 - 04:24 AM. So another year has come and I've been busy with all the stuff that has been happening in real life. But now a break and a small update of what's been going on in the Crusade. I managed to get my new Marshal (and most of his weapons) painted and got the Honour Guard painted as well, but I shall keep them under wraps until it's time to unveil the Vengeance Crusade Banner. While I was quite pleased with the results, I still don't know why I placed the cross thingy on his forehead, now he looks like a Gundam What do you think? keep it on, or take it off? edit: Posted this while not putting pictures... still not sober yet folks!!! Edited by Marshal_Roujakis, 07 June 2016 - 12:06 PM. Great work on this one! Inspiring, ornate and dynamic! I really like the cross/forehead, cloak and sword. May I ask: Where is that cloak from? 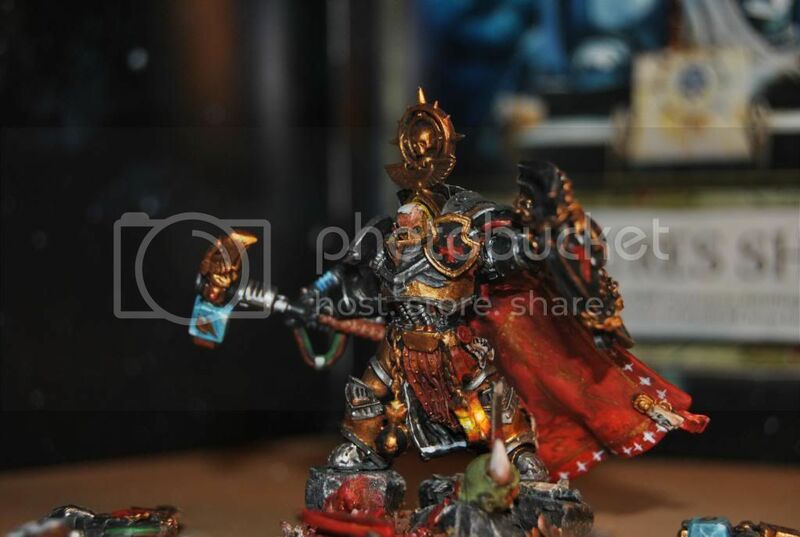 I assume the helmet and sword are conversion? And you've provided a good insight on how to do that! The Helmet is a conversion, and they are all parts from the Templar upgrade sprue. Fought a decent Tyranid army, player was going to use the old Tyranid book for the last time and decided my First would be his Last. So I happily oblidged. Don't have his list handy but off the top of my head the Units were Tervigons, heaps and heaps of Gaunts, a Deathleaper, 1 Tyrant with a Heavy Venom Cannon, Tyranid Warriors, and a mob of Carnifexes. Even in their old book, they were fightening. Not going to post the entire game as it ended at the 4th Turn because the place needed to close and we started late. So I'll just post the Highlights. Turn 2 Tyranid Death Leaper comes from nowhere, Gaunts swarm from (literally) everywhere, bunch of Rippers provide distraction by Deep Striking within my deployment zone, Tervigons rush onward with the incoming swarm, Carnifexes loom closer with their Venom Cannons in tow. My Templars hold their ground and some disembark through the back of their transports, hoping the Gaunts crash through the tanks like water on rocks, and fire at the incoming swarm, Fliers enter the game. Turn 3 Terminators, Crusaders the Marshal and his Honour Guard all charge this turn, using High Marshal Helbrecht's Crusade of Wrath and Warlord Trait, Sword of the Imperium, Dreadnought is used to stop the Rippers. The Warriors, more Gaunts, 1 Tervigon and the Carnifex mob all die at this Turn. Templar survivors consolidate on objectives. Fliers take a big toll on the enemy Giant type units. Game ended, Templars holding 2 out of 3 objectives and Tyranids only. Good Luck to everyone hunting Tyranids out there. I could give a good rundown of what I could.... er.... 'help to the cause' but there are quite a few things that I'm not so sure I could finish building by the time ETL III starts. Marshal Pendraco is one of the most notorious and most respected Marshals of the Black Templars. He has absolutely no tolerance for witches and, more than once, has abandoned allies or other forces of the Imperium just because they have a psyker in their ranks. His misgivings to Psychic individuals doesn't stop even against Astropaths and Navigators and retain a special hatred to psychic Inquisitors. There was even an occurrence where Marshal Pendraco ordered the Sword of Retribution's (Vengeance Crusade's only Battle Barge) Navigator be bound and imprisoned in a warded anti-psychic cage when the ship does not need to Warp travel. Many a times, this hatred of witches has served him well, giving him a natural resistance to any form of Psychic attacks and his fury against them always drives those around him to slay the impurity and taint of the Witch. Although there has also been multiple occasions where his hatred got the better of him, making him dive straight through enemy lines, abandoning strategies just to kill off the Sorcerer in the enemy ranks falling into traps or giving his enemy the upper hand, and his reputation in regards to abandoning allies has also garnered him enemies from all across the Imperium who are either Psychic or use Psychic allies. of Tactical Dreadnought Armour, whose origins date back to the time of the Great Crusade, and is adept in using all forms of close combat weaponry. His ferocity in combat makes him a whirlwind of destruction in the battlefield, like a great warrior in the old days of glory of the Imperium of Man. His ferocity in combat is evenly matched by his hatred, wrath,and brutality, he suffers nothing but the total annihilation of any enemy of the Imperium and his duty is to bring His light to the darkest corners of the Galaxy. 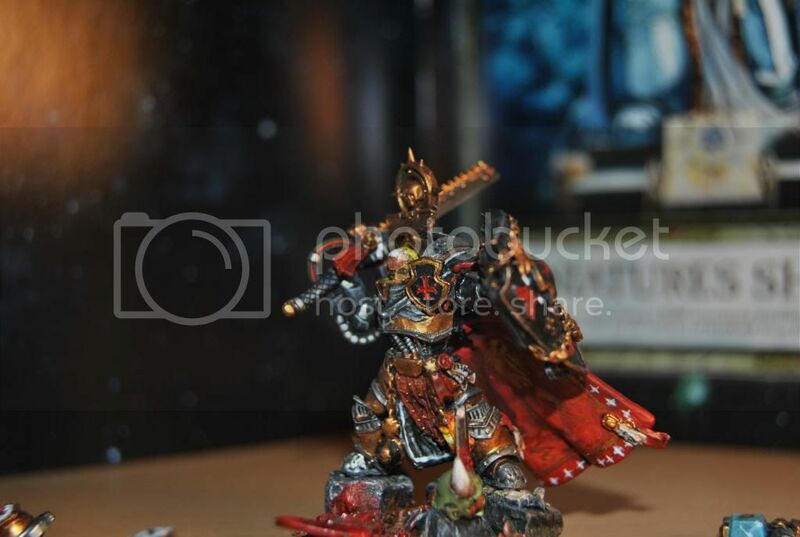 He is a soldier of the Emperor, a warrior clad in the glory of Humanity, and a Sword of the Black Knights of Dorn. Comments and Criticisms are welcome and all weapons are magnetically pinned. Crusade ON! NO PITY! NO REMORSE! NO FEAR! Edited by Marshal_Roujakis, 11 July 2017 - 06:34 PM. I love all the different weapon options, Especially that Flail, good god that thing is glorious. Agree. The Marshal is awesome anyway, but nothing says "you're dead" like three 50 Kg metal balls colliding with your current location. I really like how you painted him up. You had me at twin hammers. Much awesome. Wow. Great model and enjoyable background too. All-conquering Master of Mankind, be pleased with this war's tumultuous roar. Rejoice in furious challenge, and avenging strife, whose works with woe embitter human life!" a son of the immortal Emperor. He tenses his muscles as he readies himself for combat. His robes, marked with the heraldic cross of the Black Templars Chapter, was stretched across his broad chest as he hefted his sword high in a two-handed stance, feeling the weight of the training blade as he held it over his head. The blade wasn't balanced, so he compensated on the weight and shifted it to one side. Sensing the moment of distraction, his opponent rushes with a stab of his own blade to the other Space Marines heart. He brings his sword down and their blades clashed with a clang, they exchanged blows one after another; swinging low sweeps, parries and feints as they searched each other for weaknesses and attempted to get through each other’s guard. Suddenly, the two blades locked and they were testing their strength against each other, both men, although they have left their humanity long ago, pushed into their blades. The other Astartes released his blade, stepped aside as the other warrior lost his balance and grabbed him by the arm and swung him over his shoulder. The other warrior had no time to recover from being thrown as his own practice blade was pointed at his face. The other warrior, clothed similarly in a robe of black with a single heraldic cross across his chest chuckled, "What's wrong Brother? You seem to have lost your focus today." Hydatius said with a grin. Marshal Hydatius is the leader of the Nemerian Crusade Fleet, half of his face was made of bionic implants, reparation from a wound he suffered due to a plasma weapon during their fight against the Tau, giving him the appearance of a half machine half human, the remainder of his face was the same chiseled features expected from a Son of Dorn, proud with a strong jaw, a straight patrician nose, high cheek bones and a deep-blue eye that was under a thick brow marked with 3 golden studs signifying his years of service, he was a giant, even for a Space Marine, and in Power Armour he nearly reached the bulk of a Terminator, and his ferocity in combat is nothing less than expected from a member of the High Marshal’s Sword Brethren. He was a great man, admired by all in his command and an inspiration to all their recruits. His sore dueling partner was Castellan Pendraco, another leader among the Crusade, unlike the Marshal he was not blessed with the facial features of Rogal Dorn, he had angular features, a sharp face with a pointed nose with dark green eyes and short silver-white hair. He was a leader of the Fighting Company of the Nemerian Crusade, the Helm Breakers, and his unquenchable hatred against witches was known to all. They were tasked by their Liege Lord, the current Chapter Master of the Black Templars High Marshal Kordhel into cleansing the Nemerian System and conquer it in the name of the Emperor of mankind. The Nemos Sapiens, or Nem as humans have named them, were the Xeno race that held this system against the colonization of the Imperium’s subjects, they had unremarkable traits, brown skinned aliens that bore the features of aquatic creatures with webbed hands with tall and slender bodies similar to an Eldar, they had weak psychic powers that enabled them to manipulate the water in their environment and technology that were similar to the Tau, they were not a war-like race, preferring to be left alone to expand their borders and trading with other alien species, but their expansion into Imperial space had caused the death of Imperial citizens and had blockaded an entire system cutting off important agri-worlds and forge planets from Imperial control, the Imperium responded with their usual answer, by declaring war. The aliens put up a fight in defending their worlds, but it was nothing compared to the wrath of 300 Knights of the Black Templars. The fighting was fierce, for the aliens had the numbers to defend their worlds, the psychic powers to manipulate water, and liquid technology that could bypass even Astartes Battle Plate, but their advantage in ground based combat was ultimately outclassed by the Space Marine’s capability in bringing death from the skies. Utilizing their Battle Barge’s firepower, Drop Pod Assaults and Astartes Gunships they assaulted the system in multiple fronts, using surgical strikes aimed at destroying enemy leadership and bypassing ground based defenses. The Templars employed a behead and burn tactic, first destroying the enemies command structure with a Drop Pod or Teleportation Assault and bombarding the highest concentration of enemy resistance with the Sword of Retribution’s multiple weapons batteries, the Nem has never experienced an assault with such ferocity and hatred such as what the Templars had given them, and just three months later, the Templars were now cleansing the system from the xenos race, leaving nothing but destruction in their wake. Now nothing remained of this alien species, and the worlds they once inhabited are being colonized by citizens of the ever growing Imperium. With the Crusade done, they were now set to rearm and reinforce their numbers with recruits from Chapter Keeps in nearby systems and sub-sectors. They were in the middle of a warp transit, the Geller Field protecting them in their voyage through the immaterium, heading towards the Pelegron Cluster, to sub-sector Bassillus where multiple Chapter Keeps of the Black Templars held ammunition, prospects for new recruits and new orders from Chapter Command as to where their new objectives may be. And while in transit, Marshal Hydatius, the famed slayer of the Daemon Lord N'Krug, has asked his Castellans to spar with him in the dueling cage. Side by side, the commanders of the Nemerian Crusade watched and cheered as their master duels with their brothers, Castellan Gillian, commander of the Armoured Gauntlet Fighting Company and the one rumored to take the role of Marshal after Hydatius, looking eager to be next in the cage while next to him Castellan Matillius of the Burning Swords sports a large welt across his torso which he got from his duel a few minutes ago, Castellan Tycho, master of the Roaring Lances, grins as Matillius winces from the pain of his beating, but his smirk quickly changed into a frown as Catellan Pendraco leaves the cage and his name was called next by his Lord-Commander. As Sword Brothers of the Marshal's Honour Guard and Castellans of the Fighting Companies they could not refuse this challenge, they must lead by example among their brothers, even if this means a fight (or a beating) from their commander, the famed slayer of Greater Daemons, especially since the tenet of Sigismund, first High Marshal of the Black Templars, is to accept any challenge, no matter the odds. Castellan Tycho was about to step into the ring when the door to the training room hissed open and a Chapter Serf stepped in, surprised by the eyes of all the Crusade’s commanders on him he paused with one foot left outside the door. "What is it?" asked Hydatius, "My Lords” the servant stammered, “we have received an emergency transmission from the Eternal Crusader. Jerulas is gone my Lords." Suddenly, the ambient screams and sounds of weapons fire ceased, the temperature of the air around the city dropped even though it was a sunlit sky, sheets of ice formed on top of the plaza square creating a cold icy mist that was unnatural, a single low note blared around the city the source unknown and its sound brought the last defenders into complete despair, from the middle of the icy field, in the gate's front plaza, a crack appeared on the tiled floor where the blood of all who died coalesced, with an earth shattering roar the tear widened, splitting the ground further and violently erupted in a fountain of blood, rubble, skulls and warp flames, as a powerful Daemon Prince of Khorne bellowed and took its steps into reality. The Daemon was colossal with wings covered in blood and sinew that stretched out and blocked the light of the sun, a torso wider than a Chimera transport sporting an armor full of hooks, chains and beaten bronze, a massive reptilian tail with a spiked ball tip that swung back and forth tearing great gouges on the floor, and a warp forged Hellblade shimmering a haze that hurts the eyes of those who gaze at it for too long on top of it's massive bulk is a terrible hound-like head with needle like fangs and horns that jut out like a corona of spikes and eyes that burn with madness, fury, murder and death. It laughed, a maniacal laugh that echoed throughout the city causing any living Imperial Citizen to soil themselves, such an evil menacing howl of glee that it shook the bones of even the hardiest of veterans or the most faithful Commissars. Its massive head shook as a single bolt round rebounded off its chin and it's laughter died. The figure who has stood there motionless for three hours was now aiming a bolt pistol on the foul daemon, he placed the weapon back into its holster and raised his sword to the daemon's direction, the daemon howled with rage, and stepped forward enraged as he charged towards the single black knight in the plaza square. The creature raised its foul Hellblade and swung down, the sword connecting with the ground as the knight stepped aside, rending the floor and setting it on fire, the daemon was fast, swinging from left to right, up and down and using it's immense size and strength, its hooks and tail lashed out and flailed as well, trying but failing to cut the foolish Astartes down, despite the madness and chaos of the Daemons attack, the Space Marine, seeming impossible to hit, dodged and weaved from blow to blow, moving like a shadow of black, white, gold and crimson. Then, in a sudden flash of blue lightning amidst the red flames, the daemon froze, it stopped moving altogether, and there was dead silence as the Champion stood behind the daemon, sword held high blazing with blue flames, the daemons head slid off its neck and fell from its shoulder, the Champion of the Emperor has decapitated the vile Daemon of Khorne, it collapsed headless in a heap, like a puppet whose strings have been cut, black smoke and flames were now engulfing its remains and it started to dissipate back into ashes and dust. The Renegades lost morale as their daemon masters' murderous voice ceased speaking in their minds and the defenders thoughts cleared from the despair that has engulfed them, the same thing was happening throughout the planet, and the servants of the Emperor started to fight back with more fervor and determination as the rebels, fell back and retreated. As for the Champion, Balian the Black Knight of the Emperor, with duty done, he quit the city to rejoin his brothers, none knew of his quest here save for the Chaplain that he confided to during his ascendancy and the Emperor himself, and the city that was abandoned, no longer needed a savior, for Balian had received a vision from the Emperor, a message to relay to His people and the Renegades, and the message was received loud and clear: "The Emperor is with us, and nothing can stand against us." Chaplain Reginaldus has been on many battlefields and has survived many Crusades, he earned the honours of Chaplaincy at the end of the Jerulas Crusade, he earned his promotion as Sword Brother during the Battle of Grimoire's Gulf fifteen years prior and has even led a Fighting Company after the death of his Castellan during the Nemerian Crusade he was given the chance to lead the Chaplaincy of the Vengeance Crusade but outwardly refused the honor, saying that he prefers not to lead as a commander but merely as a servant of the Emperor's wrath. He is very stern and pious, his zealotry goes beyond the field of battle showing no room for error even among his Brothers and peers. He views other Chaplains from other Chapters as severely lacking, their zeal and devotion wanting and pushes them to further their efforts in exacting the judgement of the Emperor to their foes. He is very outspoken and has more than once vexed other Chapter Chaplains for scoffing at their lack of faith. But he truly reveals his nature in the battlefield, he is merciless, bulked up in Tactical Dreadnought Armour he charges headlong into the foe, shrugging off the enemy fire and barreling through the enemy ranks, smashing through them and using his mass to crush everything in his path, his Crozius Arcanum leaving a bloody trail of destroyed remains in his wake as he pulverizes any resistance to his zealot rage and the wrathful judgement of Imperial justice. He is a living battering ram, the Vengeance Crusade's bringer of the Righteous and Zealous Fury of the Scions of Sigismund. Currently trying to get to grips as well with a Campaign going on at our local that just started yesterday... a chance once again for the Chapter to reap a glorious victory for the Emperor! Keep Crusading! NO PITY! NO REMORSE! NO FEAR! Edited by Marshal_Roujakis, 11 July 2017 - 06:37 PM. Amazing once again... I wish I had time to put in the effort to reaching such an epic level of painting. Nice work! I liked the little intro. Especially the paragraph talking about the crusader and how it was offensive that enemies would come back to Jerulas. One little thing that's a pet peeve of mine: name dropping. Your crusade has a lot of character, you don't need many big names to give more to it. Onto the models: Impressive! You have a knack for dynamic posing, whereas I usually end up with either "awkward" or stiff. And I really like the banner too! Great work on the painting, and on making it look like a chapter banner. I need to steal that little shield idea! I think some Dark Angels have infiltrated your crusade! Be wary brother! Looks awsome and love it! Is that a chain fist on the master of sanctity. I cant see well becase of phone. Also how has he worked for you in games? The model looks so beautiful that I have the urge to buy everytime I go on gw's site. Looking great!!! Really like the emp champ! We've been picking these guys up all throughout the sector, they were wearing Black Power Armour but with no emblem or insignia, we were very suspicious at first but they have proven their merit and worth, and have passed tests of zeal and loyalty... we thought they were Dark Angels, but upon interrogation they denied it. The model is beautiful... he used to have a Power Axe until GW decided to scrub our Chaplain builds for a weaker variant... now I run him as a Terminator Captain with a Power Maul and a Chainfist... still not as awesome as the original Chaplain but he works best in the field as a beatstick against both infantry and vehicles. Oh! I think you misunderstood my comment. What I meant by "name dropping" is integrating special characters like Helbrecht/Grimaldus/Ludoldus or important places/relics. It needs to be done sparingly, otherwise it looks weird when your crusade is the special one getting time from all the big guys. On second reading, I'm not sure why I mentioned it though, Jerulas and Helbrecht are big names, but your use of them is pretty cool. Take care for this stuff to not corrupt your crusaders.